This story first appeared in Gold & Treasure Hunter Magazine Nov/Dec, 1998 on Page 24. This issue is still available! Click here. This story is dedicated to my long-time loyal friend and fellow adventurer, Ernie Pierce. Ernie and I did three prospecting trips to Madagascar together, of which this is just one of the stories. 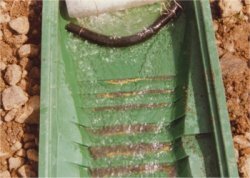 He played a very important part on this project in working out how to increase fine gold recovery when processing heavy sands through standard riffles within the sluice box of a suction dredge. Ernie has an enthusiastic, magic disposition for being able to work out solutions to challenging problems in the field. He also overcame the primordial fear that every human being has of going down into deep, black underwater holes (where dangerous monsters lurk, if only in your imagination). I don’t know very many people who are willing to do that! It has been one of my greatest pleasures, and it has been a personal honor, to participate in adventures alongside of Ernie in California, and in multiple other interesting places all around the world. challenge of passing the slower vehicles without running into something coming from the other direction. One blind curve after the next placed us almost entirely in the hands of fate. Our driver had no way of knowing whether a vehicle was or was not coming from the other direction, as he committed our vehicle to many of the “go-for-it” passes that we made. I was holding on for dear life! 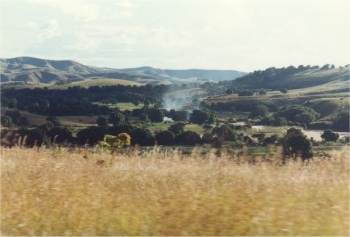 Madagascar was colonized by the French, so driving is done on the right side of the road. Being on the right side of the road put us dangerously-close to the precipice! At the high speed we were traveling, I was certain my time had finally come this late afternoon! On several occasions, by my calculations, there was no possible way that we were going to make it around the next curve! There just wasn’t enough room on the road to get past oncoming traffic without our wheels slipping over the edge of a very deep canyon. I couldn’t even see the canyon’s bottom! 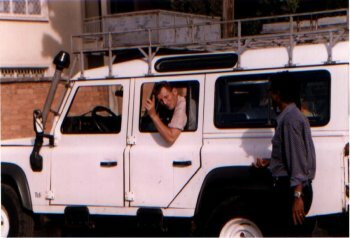 Each “go-for-it-pass” succeeded, either by divine intervention, or by the incredible driving ability of the young Malgasy man at the wheel. I have lived a pretty gifted life, and I find myself counting my blessings pretty often. It’s not that very much was given to me; I have pretty-much had to climb the painful ladder of success several times. The end-result is all the more sweet when you have to work hard and sacrifice greatly to get there. I have lived on the cutting edge of danger a good part of the time; this is really true! There are not that many more things I feel I need to do before I meet my end of this life. So I find myself saying every once in a while that when the time comes, I am ready to move on to whatever is next. A lot of people say they/we are not scared to die. And you really feel that way when you are saying it! But we only feel that way when we are not looking death right in the eye! When sudden death lurks near, I feel the terror just like anyone else! As quickly as the hair-raising ride began, we suddenly found ourselves safe at the bottom of the mountain. The immediate danger was over. We were graciously treated to a hot meal and a comfortable bed in the best (and only) hotel in the small village located at the base of the mountain. It was great to still be alive! 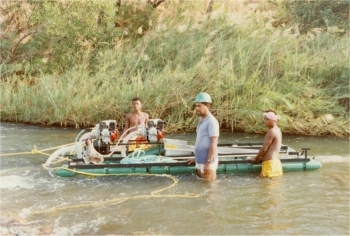 This preliminary dredge sampling program was on behalf of clients who own some gold mineral concessions in Madagascar. Ernie Pierce was along to assist with the sampling. We were there to get a preliminary idea of how much gold we could recover using suction dredges on two large rivers. We already knew gold was there because of an earlier expedition that we made into both locations to do a preliminary evaluation. Local gold miners were mining gold all over the place. They were mostly panning river gravel alongside the active river. Some were shoveling gravel from the active waterway in the shallow areas. Others were shoveling deeper-water areas out of dug-out boats, using the longest-handled shovels I have ever seen. The native miners were getting gold from everywhere! As this area was accessible by road, the logistics for setting up a dredging project were not too bad. We arrived with a substantial contingent of people and equipment. 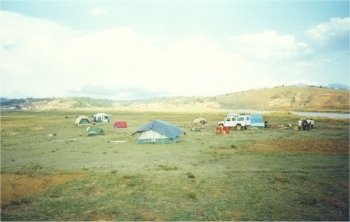 We had enough support to move us around, set up our camps, cook for us, do laundry and take care of all our basic needs. The company we were working for had quite a substantial base camp located where the end of the road met this river. There was a mess hall, some hot showers, individual bungalows; all the comforts of home! Unfortunately, the river near to and downstream of the base camp appeared to have deep sand deposits everywhere. There was no bedrock showing anywhere along that part of the river. Our initial impression was that the sand deposits in that lower section of river were going to be too deep to penetrate using our 5-inch sampling dredge. So we made a plan to pack all of our sampling gear and a fly camp (only basic needs) several kilometers upstream where the streambed deposits were shallow to bedrock. Our intention was to float down river, dredging sample holes through the entire distance back to the base camp. We spent the better part of a rather uneventful week dredging sample holes on this first river. Interestingly, while local miners were supporting their villages panning gold from placer deposits alongside the river, we could not find any high-grade gold deposits inside the active waterway. Ernie and I devoted long hours to making sizable excavations through hard-packed streambed material to bedrock. 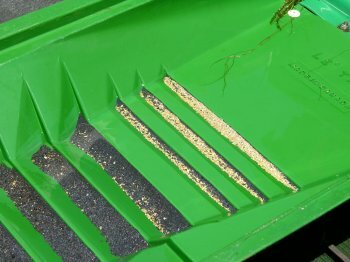 And while there was some amount of gold present everywhere, we could find no places where gold concentrated enough to justify any type of production dredging program. While we could speculate about the reasons why, the important thing was that we ruled out the possibility of a commercial dredging program in this area. This was what we went there to do. End of story! As we did not bring anything extra with us when we packed our gear into the upper area of this river, I was not able to capture video until we arrived back down near the base camp. The video link just above includes a sequence that I took while we were dredging the final sample in front of the base camp. See how deep the light sand and gravel deposits appear to be? We did not expect to find the bottom of this loose streambed material, and we didn’t. But our sampling plan required that we at least try in several areas. After spending a week on the first river, we were eager to relocate ourselves and our sampling infrastructure over to the second river that we intended to sample, which was several hundred miles away. That process took several days to accomplish. Prospects for commercial dredging opportunity on the second river looked much better to us during the earlier preliminary evaluation. We decided to save this area for last so we could devote most of our time there. Normally, the first thing we do before making a sampling plan on a new section of river is walk, boat and/or swim the entire length if we can, to see what is there. This allows us to look everything over to see where the best opportunities appear to be. If lucky, we will come upon local mining operations. Those will communicate a lot to us about the prospects. This is because local miners, having spent generations prospecting for gold in the area, will already have a good idea where the best potential opportunities are for the type of mining that we do. Note the active shoveling operations in the river behind where we were pulling the dredge upriver. How clear is the water? The first and most important fact of note about the second river was that it was flowing with muddy water. Too bad! Water clarity is the first thing I look for when evaluating a river for dredging. Will I be able to see anything when I get on the bottom of the river? The answer in this case was an emphatic “NO!” This was pretty disappointing to me, because I had been assured by Sam months before, when we proposed the sampling program, that I could depend upon having clear water in this river. As it turns out, this particular waterway drains many thousand acres of upstream rice paddies. It never runs clear! This was not Sam’s fault. It is nearly certain that you are going to get wrong information from locals in these types of places. With the help of even the best interpreters, communication and understanding tends to break down on technical things. 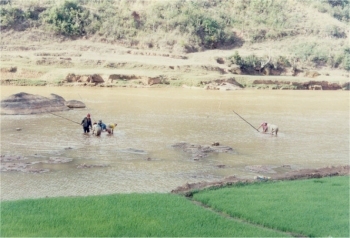 What is clear water to me, and what is clear water to a rice farmer in remote Madagascar, are sure to be widely-different perceptions of reality. Especially when he has never even seen a face mask or a diver before! Over time, on the important things, I have learned to keep asking the same question over and over again in different ways. In doing so, it never ceases to amaze me how many different answers we come up with! Sometimes, no matter how many different ways you pose the questions, you can still never arrive at an answer that you have much faith in. This is not because the locals are lying. It is usually because their perception of the world is so vastly different than ours. 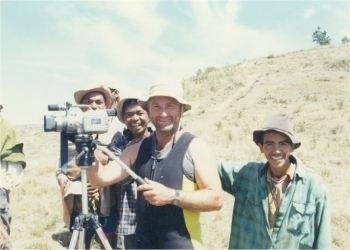 Sam Speerstra is the true-life incarnation of “Indiana Jones.” Sam has gotten me into and out of more (mis)adventures than anyone should experience in a single lifetime. The last dirty river Sam had me diving in was full of crocodiles and electric eels. That river was a nightmarish diamond project in Venezuela. Without visibility, there was no way of knowing for certain what was on the bottom of this deep river! I’m not talking about the gold; we can figure that out through careful sampling. I’m talking about the critters! When I initially evaluate a tropical river for a potential dredging project, the second condition that I evaluate after water clarity is whether or not there are life forms present that are potentially dangerous to me or my helpers. I do this mainly by visual observation. First, I look to see if the local people are working, washing, bathing and swimming in the water. If they are, and they appear healthy; I generally assume that the river is alright to dive in. Although, locals always have a stronger resistance to higher levels of bacteria in their local rivers. So our standard medicine kit on these projects always contains a supply of the best antibiotics to prevent serious types of internal or external infections. I also ask the locals about sickness and dangerous critters. However, the problem with asking about critters in the water lies with the interpretation. You cannot depend upon only one inquiry or interpretation. For instance, I will never forget the size of the alligator I saw along a river in Borneo several years ago. This was after assurances from our local jungle-guides that alligators did not even exist there. We had been dredging the river several weeks when I suddenly encountered an alligator which must have been 18 feet long! It turned out that these man-eaters were being called “dragons” (not alligators) by the local village people! So I have learned to frame the most important questions in numerous different ways, and I keep asking them over and over again to different locals as I am trying to find things out about a new area. It is one thing to read about this in the comfort of your computer within a safe environment and feel like you can do it. But you are not exactly the same person when you are dangling dangerously in the dark. You might be the same basic identity; but other parts of you (like terror) get switched on at full volume. I suppose you would really have to go through the experience to fully-appreciate it. Until you do; take it from someone who is used to living on the edge: Diving down in deep, muddy, tropical rivers is not easy! Muddy water creates total darkness about three feet beneath the water’s surface, sometimes less. So, all you can see down there is what is in your imagination. Do you remember those terrifying nightmares that you had when you were a kid? They still lurk in your subconscious. When going down into deep, dark, terrifying physical places, memories of nightmarish dreams are brought immediately back to life. If you are someone who doesn’t think you are afraid of anything, you ought to try diving in deep, muddy, tropical rivers! You will find there that your deepest fears are just below the surface of your normal, everyday life. Let me try this a different way: Do you know that feeling when someone startles you at just the right (wrong) time and frightens the heck out of you? Just for that split second, you feel a deeply-seated fear; right on the edge of a panic attack? That is exactly what you experience when you go down into the deep darkness of a tropical river; especially on the first dive. Nevertheless, over time, I have learned to deal with dirty water. This does not mean that I am not still afraid. I am! It means that I have worked out a way to proceed. Dredging in dirty water is a much slower process. Everything must be done by blind feel, and therefore with care. The process is all about taking control over a single space in the darkness. You get to know every rock in the hole and every obstruction which defines the space. Sometimes, there are submerged trees or other obstacles that you must be very careful around to prevent your airline from becoming snagged. You must dredge alone in dirty water. Otherwise, you cannot toss rocks or roll boulders out of the excavation without a good chance of hurting someone else down there that you cannot even see. Several years ago, my lead diver on a dirty-water sampling operation in Cambodia had a portion of his ear bitten off by a fish. One quick bite and it was gone! That created lots of blood and drama to slow the job down! After that, none of the other guys that I had brought with me wanted to dive. Who could blame them? But we still needed to complete the job; that’s what we do! Surprisingly, it was the lead diver who had to continue the diving on that particular job. I did a little, too; but, that was mainly to show the other guys that I would not ask them to do something which I personally was not willing to do. We wore full dive hoods and dive helmets to protect ourselves from the biting fish, whatever it was. We never saw the creature that took the bite! And as it went, just a few more dives to finish the job proved-out one of the richest gold locations I have ever discovered. But underwater, we couldn’t see a thing! The primary consideration in assessing a dirty river is how much more time we need to allow ourselves to get the job done in an underwater environment where the divers cannot see anything. This is one main factor which nearly always undermines the commercial viability of a sizable dredging operation. Who is going to go down and run a 10-inch dredge in zero visibility, 6 hours a day, for a living? The gold deposits will have to be very rich to support this kind of program. I have found several underwater gold deposits that are moderately rich, but they are protected by dirty water conditions. The deposit that we found in Cambodia, for example, would make a dredging operation a lot of money if the diver-visibility problem could be overcome. People often ask why we need to send divers down in the first place to conduct a gold dredging program. They want to know why the excavation cannot be managed from the surface using mechanical arms. The reason is that sizable rocks along the river-bottom must be moved out of the way of the suction nozzle. Otherwise, one oversized rock (too big to go up the nozzle) after another gets in front of the suction nozzle, blocking further progress until it is moved out of the way. Because of this, with few exceptions, there is no other effective way to proceed without putting divers down into the depths. 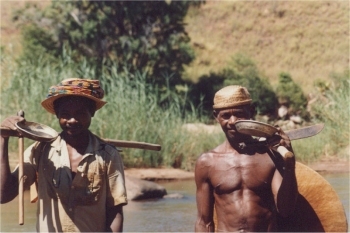 When Ernie and I first started watching the local gold miners on this particular river in Madagascar, we relaxed our fears; because even their small children were bathing and playing inside the river. This was a good break for us! Secondly, Ernie and I offered financial rewards to the local miners for each place they showed us to dredge where we could find lots of gold. Such places are usually in the deeper areas where locals cannot gain access using the gear at their disposal. A “grande” reward goes to the person who shows us the place where we find the most gold. 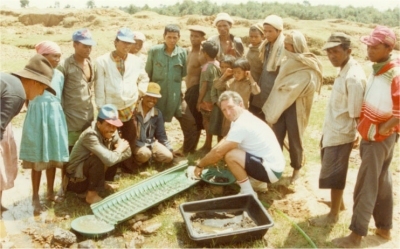 Wow, this incentive sure got Malagasy miners talking; and we started to find a lot of gold! We moved our sample dredge in direct line with where local miners were doing well working out of dug-out canoes using long-handled shovels. This got us into rich gold right away! In one location, I decided to sample directly underneath a native “boat-mining” operation. I did this because I noticed the natives were working the location very aggressively. This is always a good sign! They were using long-handled shovels, about 20 feet long, from anchored boats well out into the river. The water was at least 12 feet deep! These shovels were especially designed to bring gravel up from deep water. The natives were very good at it. Have you ever tried shoveling material from underwater? Nearly all the material washes off the shovel before you can get it to the surface. Not with the Malagasy boat miners, however. They were bringing up full shovels every time. The material was being panned at the surface. 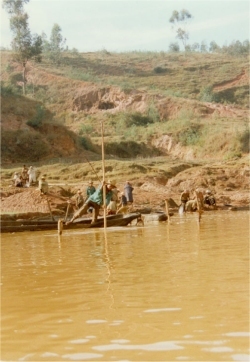 As it turned out, local miners from the boat-mining operations had plenty of gold to sell! They were anchoring their boats out in the river by driving hardwood poles deeply down into the streambed material, and then tying their boats off firmly to the poles at the water’s surface. 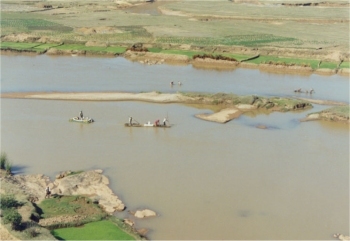 The boats needed to remain stationary to allow the miners a firm platform from which to work the hard-packed streambed material along the bottom of the river. Consequently, we could look along the river and see many stakes remaining from earlier mining activity. Unsurprisingly, most of the stakes followed a common line down the river as far as we could see. We still needed to confirm it by sampling, but Ernie and I had a pretty good idea where the high-grade gold line was located in this river even before we unloaded our sample dredge from the truck. This was good! Ernie and I felt it was important to get one sample directly under one of the active boat-mining operations. This was so that our clients could estimate the value of gold deposits that local miners were developing in the river, and to see if they were excavating all the way to the bedrock. I was the one to dredge that particular sample. To accomplish this safely, we paid those particular boat-miners to stop digging for a few hours while I was under their boat. As we had to drive our dredge out past the middle of the river to reach their hole on the bottom of the river, it was quite a challenge to find their hole in the pitch dark. When I finally found it, I was amazed to discover that they were actually penetrating deep into the hard-packed streambed material with their long-handled shovels. This must have presented them with a substantial challenge, because the cobbles were tightly interlocked together. At the bottom of their excavation, I found that their shovels were touching on bedrock, but that there was no way for them to take up the highest-grade material which was resting directly on bottom. They also were not able to clean the natural gold traps inside of the bedrock where most of the gold should have been. Too bad! Being mindful that I was dredging in a high-grade deposit that had been previously located by other miners, I did not stay under the boat-miner platform any longer than it took to dredge up about a cubic meter of the hard-packed pay-dirt off the bottom. The material was only around four feet to bedrock; an easy place to dredge even in the dark water. 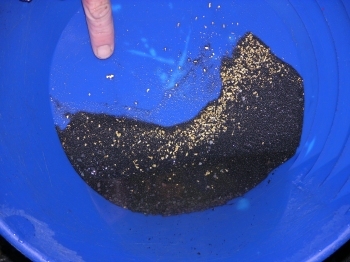 We recovered a lot of gold proportionately to the volume of streambed that I processed. My estimation is that the river could produce 5 ounces of gold per day in dirty water using a 5-inch dredge. The gravel being brought up from the river bottom by local miners was panning out very well! As it turned out, the local miners were greatly impressed and worried by our dredging machine. They watched the volume of gravel wash across our sluice box, while they were bringing it up one small shovelful at a time. Prior to our arrival on the scene, they were the biggest and the best miners around! They could put two and two together, however. After our test under their boat, they began 24-hour boat-mining operations in that location. You could see their campfires down by the river (for light) burning all night long. Within a few days, there were a dozen boat-mining operations going full blast, 24 hours a day. They were worried we were going to return and dredge up all their gold. As good as their discovery was, we were not going to do that. Our sampling thrust thereafter was to determine if the high-grade streambed material extended downstream; and if so, how far? There was certainly high-grade gold at the bottom of the river! I’ll never forget Ernie’s first deep, dirty-water dredging dive. I could see that he was pretty nervous about taking the dive, so I offered to walk (crawl) him out into the river for the first time. He agreed to this. After everything was up and running, I took Ernie by the hand and crawled alongside of him in total darkness out to the middle of the river. It was a long way out to where Ernie was going to help finish the sample that I had already started. We grabbed onto the suction hose and dragged the dredge out into the middle of the river, instructing the dredge-tenders to allow the dredge to follow our bubbles. The water was about 12 feet deep in the middle of the river. I could tell that Ernie was having a difficult experience by the way he was gripping my hand. He was holding on for dear life! Finally, Ernie had enough and he began giving me the signal that he wanted to go back to the shore. I got the message immediately from the way he was grabbing me with both hands and jerking me toward the dredge. After we returned to the surface, Ernie told me that he was just “not up to it.” He had that look of panic in his eyes, a feeling I personally know very well! There is no use in trying to push anyone into doing something while they’re in a state of fear and panic. As I have said, it is not easy diving in dirty water! We all have a limit, beyond which we are not willing to go! Instead, I urged Ernie to do some initial sampling in shallow water so he could get a feel for it. He could work standing up, with his head out of water, if he needed to. Ernie was up for this and immediately went to work closer to the shore. We needed to get some samples over there, anyway. A few minutes later, on his own determination, Ernie went bravely out into the middle of the river and was taking samples from the particular area where we really needed them; in line with where the locals were getting the most gold for their effort. Dirty water dredging is an experience you really have to ease into at your own pace. Ernie adapted quickly, and was soon working efficiently. I could tell this by the continuous gravel which was washing across the dredge’s sluice box. Each of us has our own personal limits. Would you walk a tight rope suspended a thousand feet in the air between two tall buildings? Most of us wouldn’t! What would it take to get you to do it? It takes a lot of personal courage to go well beyond our normal comfort zone into the realm of personal terror. The type of work I do often allows me the opportunity to watch others confront their own personal limitations. In defining this particular character trait of an individual, it is unfair to make your judgment based upon where the initial limits are. True courage is tested when a person is confronted with the need to go beyond personal limits, no-matter where the limits are! I was very honored that day to be present when Ernie overcame very personal and serious fears, and went out into the middle of the river to help accomplish what we were there to do. On one occasion, Ernie came up the suction hose in a real hurry! I saw the dredge bob up and down as he pulled himself up the suction hose. As it turns out, Ernie was walking around on the bottom of the river (total darkness), and he stepped off into a “bottomless hole”. When he got to the surface, Ernie said that it all had happened within a split second. He suddenly found himself dangling like fish bait from the end of the 20-foot suction hose directly over the “depths of hell.” Luckily, the weight of his body did not pull the suction hose free from the power-jet. I have had the same experience happen to me in dark water. So now, I am careful to take only small steps, feeling my way along the bottom slowly to avoid frightening surprises! One of the most important things to do in any sampling program is test the efficiency of the recovery system that is being used. To do a proper job of it, you must establish how much of the target mineral (gold, gemstones or whatever) that your recovery system is not catching when processing the raw material from each sample. You cannot just assume the recovery system being used is providing 100% recovery. You have to make regular tests of your tailings using other recovery equipment that can provide the most accurate results possible. During a preliminary sampling program, this usually means careful panning of random tailing samples. On this program, since we had plenty of very experienced local panners giving us support, whenever possible, we directed our dredge tailings over near the riverbank where our helpers could pan everything that passed over the dredge. They would then show us what we were losing from the dredge. Since our most important samples were dredged out in deep water, Ernie and I ended up building a wooden box that we were able to suspend from its own floats and catch all the tailings from our dredge. After each sample was complete, while we processed the dredge concentrates through our special concentrator, local miners would carefully pan all our tailings for us. As it turned out, our losses from the dredge initially were quite substantial. This river had a lot of fine-sized gold that was just passing through our recovery system into tailings with sand. Within the limitations of the tools we had available to us in the field, Ernie and I tried different ideas to improve the dredge’s recovery system. Ultimately, Ernie came to the conclusion that the classification screen needed to be raised further away from the riffles in our sluice box. This allowed more water flow to help the riffles to concentrate. Working this out in the field gave us important insight into what would be needed in the recovery system on a commercial dredge in that area.